Almost every apartment has its own balcony. And this room serves everyone for different purposes: often some make it a warehouse for all unnecessary things in the house that do not fit in the closet or simply interfere in the house, others in the winter and autumn store vegetables there, others do not use it at all . Yet such use of additional space in the apartment can not be called rational. After all, the balcony has a fairly large space, why not make it your own office where you can concentrate and work quietly, a small winter garden, a workshop, a playroom for children or just a comfortable place to relax. But in order to realize all these fantasies, you need to take care of good glazing and warming of the balcony. However, it is easier said than done. Further in the article you can learn how to glaze a balcony with your own hands. 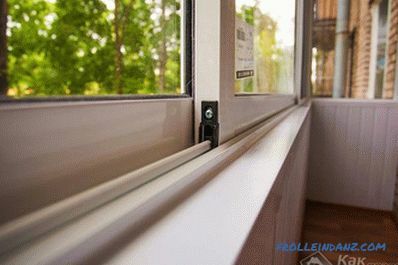 To install windows efficiently and quickly, you need to adhere to some rules and details. Let's take a closer look at everything. In order to glaze your balcony, you first need to decide what to glaze it and in what way. Indeed, today there are many options. Let's consider them, then you will be able to choose the one that suits you both in price and purpose. Cold glazing has been used for many years, but not lost its popularity now. Single panes are inserted into the lightweight frame. This is the cheapest option, since you can only protect the balcony from the external environment, but do not warm it to make a study or a place to rest out of the room. The main purpose of cold glazing is to protect the balcony from precipitation, wind, dust, dirt and debris. To some extent, you can protect yourself from noise from the street, but not fully. To glaze a balcony in this way, most often use wooden frames and an aluminum profile. creating a cozy space protected from the external environment where you can have a good time, especially in summer. if you make a frame of wood, with time it can rot and collapse. Panoramic glazing of a balcony is very attractive and spectacular and is often done in elite class homes. In this case, the glass fence is mounted from the ceiling to the floor, without the use of frames. Bottom and top install guides into which the glass is inserted on special attachment points. Because of this, it seems to you that there is no glass on the balcony at all, and you are standing in open space. To make such glazing, you need to use a special durable glass, it is stronger and thicker than usual, they are not so easy to break with a simple blow, and they will not crack in severe frosts. 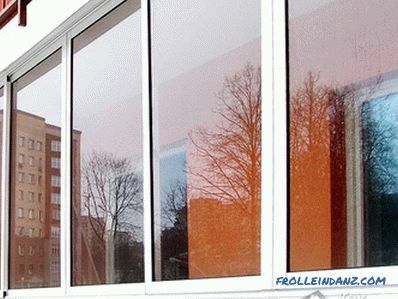 Choosing this type of glazing, you can provide good sound insulation. However, it is impossible to perform such glazing on your own, since such work requires professionalism. Glazing sections can be folding, hinged or sliding. much more light enters the room. in the hot summer time the balcony will be exposed to direct solar more rays, due to the lack of parapet and frames, so the room will be hot. Sliding glazing is used when the balcony occupies a small space, therefore it is more expedient execute it. Thanks to the special roller mechanisms, you can simply move the flaps, which do not take up much space. 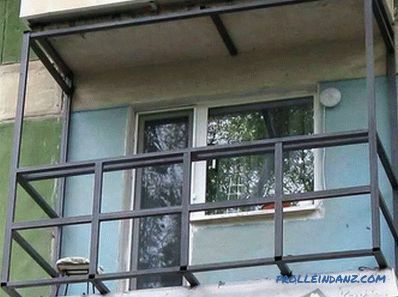 saves space if you live in a Khrushchev and your balcony is very small. poor thermal insulation, since the construction is often made of aluminum with a single glass that cannot completely retain heat. Plastic is the most common material for work, since it is plastic frames with single-chamber and two-chamber double-glazed windows installed to provide heat and sound insulation on the balcony. This material is inexpensive and performs well the functions for which it is intended. Your room will be warm and comfortable. 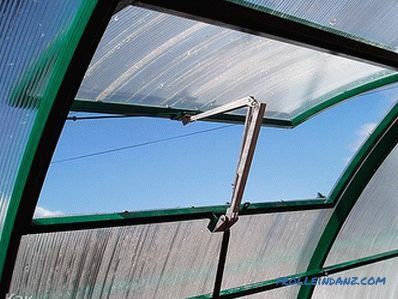 Of the advantages of plastic products should be noted the strength of glass, good thermal insulation and tightness. Glazing the balcony with plastic windows, you also save yourself from the need for frequent painting and complex care. Moreover, this balcony will look quite decent and beautiful. Aluminum glazing is done using aluminum profiles - they are much lighter and thinner than plastic. In this and its advantage over other materials. 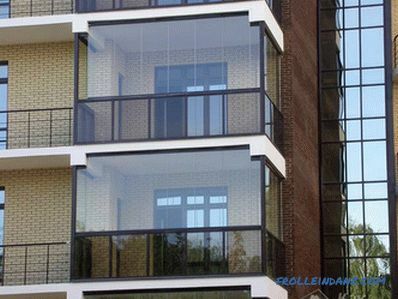 Due to their low weight, such glazing frames can be installed on balconies, which have a weak construction, unable to withstand heavy loads. 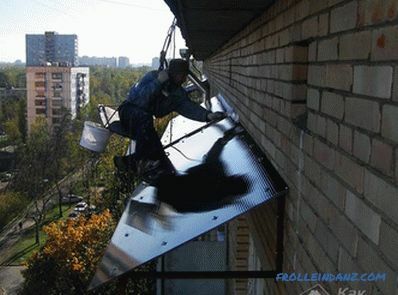 Most often aluminum is used for cold glazing of a balcony using single glass. The most affordable option for glazing a balcony can be called wooden frames with single glass. 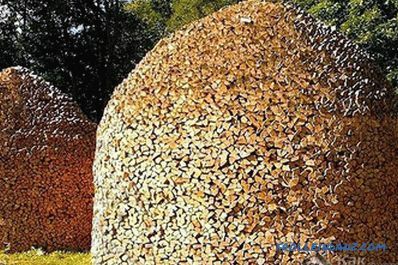 Usually cheap wood does not have sound-proofing characteristics and can let the cold inside the room. However, this can be said about the budget option. If you do not save, you can buy modern frames, which are much more expensive, but have excellent sound insulation and thermal insulation characteristics. Moreover, this glazing looks natural and gives the balcony a solid look. So, having considered all the glazing options, having learned about the materials that can be used for this purpose, you can weigh the pros and cons to choose the option that will suit you both in terms of material and for the realization of your goals . Now let's find out how to properly glaze a balcony with your own hands. 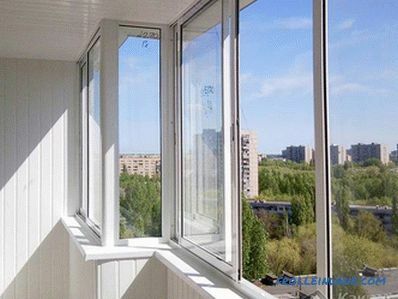 If you live in the Khrushchev , it should be noted that you will not succeed in simply glazing the balcony, since you will encounter a number of difficulties. The first of them - when initially designed the house, no one imagined that the balconies will subsequently be glazed. Therefore, the balcony was an additional concrete slab protruding from the wall of the facade of the house, which is simply enclosed by a lattice fence on three sides. Frames with glass or other devices that would separate the inner space, in this balcony was missing. 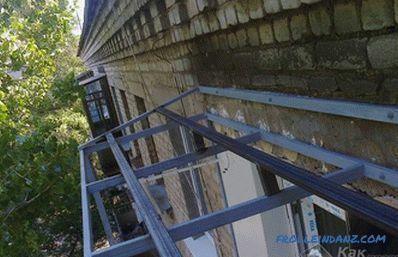 That is why, when you decided to glaze the balcony with your own hands, it is important to consider that first you need to install a single structure that would include the frame, the mechanisms for opening, the parapet of the balcony, which should be sheathed. 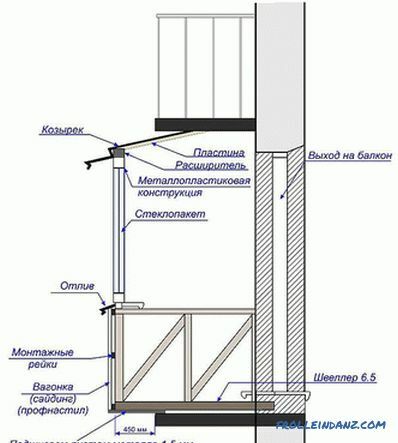 All these additional elements will naturally weigh down the entire structure, which, in turn, will put additional pressure on the balcony and the supports. All this can lead to the collapse of the supports. It is worth considering that if you live on the last floor, then during the implementation of the glazing, you are waiting for work on the construction of the roof. Such work will significantly increase the complexity of the process itself, and will also affect the weight of the whole structure. If you have already done all this, or your balcony is glazed wooden frames, which have already outlived their own and became unsuitable for further use, they simply need to be replaced with new ones. Let's find out more about how this can be done. Before you begin to work, it is important to take care of their safety. Well, when the balcony is on the second floor, where the height is small. But when you live on the 5th floor or higher, the distance to the land is rather big. And since the work will be carried out on an open balcony, the wind or earthly force can play a cruel joke with you. Therefore, all work must be carried out with a safety belt. You can buy a regular sports belt, which is cheaper and lighter than industrial. It is clear that the industrial belt is more reliable and durable, but there will be enough sports for the glazing works, but you are not doing climbing. 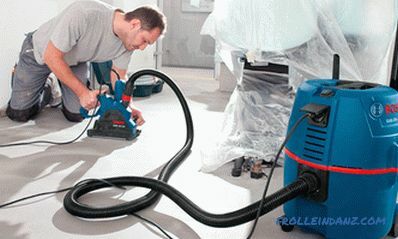 When choosing, pay attention to the length of the file, which should be at least 2.5 m to ensure comfortable operation. 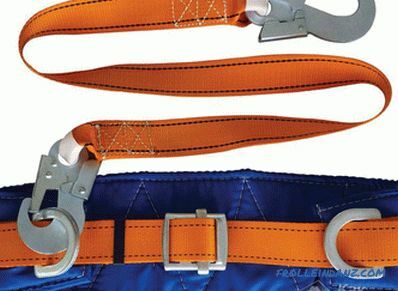 A belt with a short tail will only complicate the work, and if it is very long, you may be injured when falling. It is important that the belt as a whole and the carbine could withstand a load of about 400 kg. The size of the load must be indicated in the certificate, but if there is none, do not buy this belt. 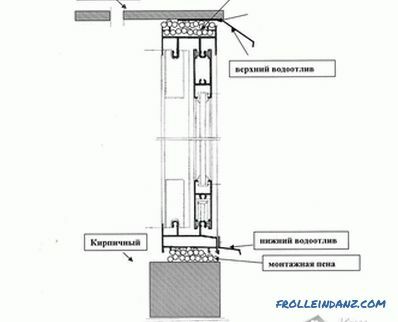 Now, after purchase, you need to provide a secure mount for the safety line.Therefore, for the period of glazing in the main wall, it is necessary to fix the anchor stud having a metal collet, pushing it no less than 15 cm deep. A safety halyard will be attached to it. Due to compliance with elementary security measures, you can protect yourself from serious injuries and even death, so be especially careful! First of all, your task is to perform all the necessary calculations and measurements. 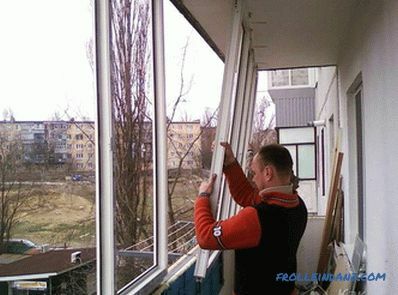 The old glazing must be removed: the frames and all fasteners are dismantled. Then take a tape measure and measure the distance from the ceiling to the parapet. Write down the data on paper. Then measure the distance from one wall to another, write everything down. Take the building level and, putting it on the parapet, check its horizontal position. Everything should be smooth. Now, having all the data, you need to contact a specialized company that sells plastic windows to place an order. 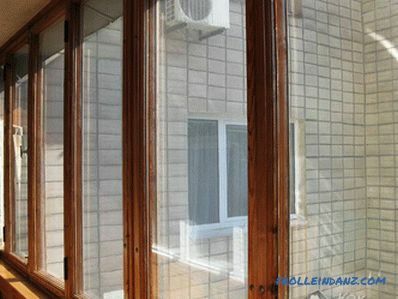 If you just want to protect yourself from wind and rain, while there is no particular desire to use the balcony as a room, you can order a single-chamber double-glazed window, which is cheaper. If the aim is to warm the balcony so that you can relax or work there, then pay attention to double-glazed windows or even three-chamber windows. To make the balcony warm, windows alone are not enough. We'll have to insulate the entire structure: the floor, walls and roof. Only then, in the complex, you can ensure that your balcony becomes a warm place, part of your warm apartment. First of all, you need to remove the glass unit from the frame. 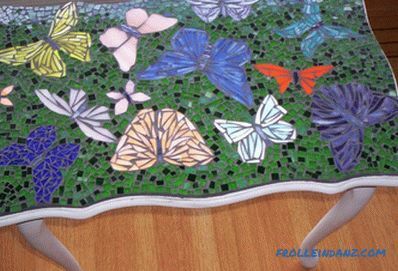 To do this, you need to remove the fasteners (beadings), which are not fully driven by the manufacturer. When they are tightly fixed, they can be removed with a spatula or knife. This is done not only to protect themselves, but also to facilitate the entire structure for ease of operation. It is not necessary to remove the glass from the doors, since the doors themselves will also need to be removed. Glasses should be put on a perfectly cleaned floor or on a bed in a room so that debris and other objects will not damage or scratch them. Now remove the opening flaps from the frame. Fully lock the window so that the handle is pointing down. 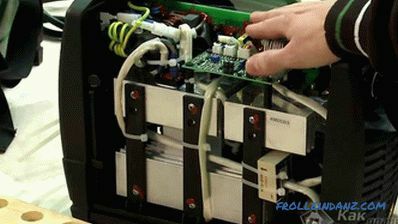 Carefully remove the top and bottom hinge covers. Remove the pin from the top hinge by pushing it from above with a hammer or pliers, and remove it from the bottom with pliers. Holding the window, put the handle in a horizontal position. After that, tilt the flap towards yourself and lift it 5-6 cm and remove it from the bottom hinge. Before you install the frame on the parapet, you need to attach special fasteners to it, called support profiles. They must be bundled with the window itself. Holes and slots are provided in advance in the frame into which the profile will enter, after which it is fastened with self-tapping screws. Throughout the entire perimeter, you must pre-drill holes for the anchor bolts with which the frame will be fixed to the wall. The distance from the corner of the frame to the first fastener should be 12-15 cm. Align with the level Insert the frame into the opening and align it with level three planes. To transfer the weight of the product to the wall, use the support bars. Initially, the frame is fixed in the opening with the help of wedges, which are inserted between the frame and the opening. Using anchors, attach the frame to the parapet, ceiling and wall. On each side of the structure there should be no less than three fasteners, and the distance between them should not exceed 70 cm. From the inside, a vapor barrier tape can be glued on the ends around the entire perimeter of the frame. After that, the space between it and the wall must be zapenit and, without waiting for the foam to completely dry, glue to the opening. Pay special attention to the corner joints. Insert the glass panes and the sash back into the frame. Attach a vapor barrier to the bottom of the frame and install a window sill. Now it remains to check the operability of the sash and the tightness of the entire glazing. To bring everything to the desired "condition" and to give the balcony a more attractive look, you need to make slopes. Please note that all work must be carried out not in a hurry. Follow all the rules and follow the sequence of work. In fact, there is nothing complicated if you figure it out and understand what to do and how. Having done all the work yourself, you can significantly save your money. When you have provided a good glazing, you can easily start to warm your a balcony if you want to make an extra room out of it. 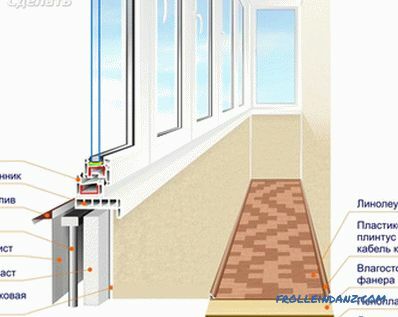 Thanks to plastic two-chamber double-glazed windows, there will not be any heat coming out of the balcony, and good thermal insulation will be ensured. You just have to warm the walls, the floor and the roof, and then you can fully use your new room as an office, a rest room or something else. By the way, why would you use such a balcony? You can share this in the comments! 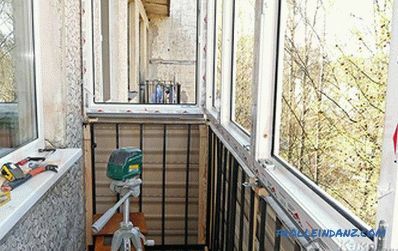 How to prepare a balcony for glazing. How to make a balcony with the removal.